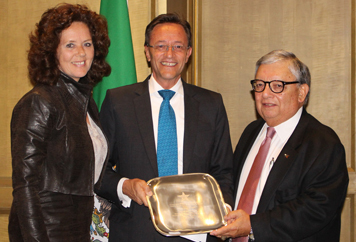 Mexico City, October 29, 2014 – The United States-Mexico Chamber of Commerce presented the Buen Vecino Award to Monte Alejandro Rubido Garcia, Mexico’s Commissioner of National Security, Jerry Patterson, Commissioner of the Texas General Land Office, and Eduardo Ramos-Gómez, Duane Morris Partner, and President of the USMCOC Northeast Chapter, during the Buen Vecino Awards Gala held October 29, at the St. Regis Hotel in Mexico City. Security is a key factor for the development of businesses, and the USMCOC Board of Directors acknowledged the outstanding career and commitment of Mr. Rubido as the head of the Mexico’s Commission for National Security. Mr. Jerry Patterson, throughout his tenure as Texas Land Commissioner, has made important contributions to the U.S. and Mexico relationship, fostering mutual understanding and collaboration, and in particular for his strong support of the Border Energy Forum, which this month celebrated 21 years of existence, and has become an essential forum for the public and private sectors to the energy industry along the border area. From the private sector, the USMCOC presented the award to Ramos-Gómez, Managing Partner of Duane Morris’ offices in Hanoi, Ho Chi Minh City and Singapore. He formerly served as Mexico’s ambassador to Singapore, Negara Brunei Darussalam and the Union of Myanmar, and has been a strong supporter of the USMCOC for over a decade. 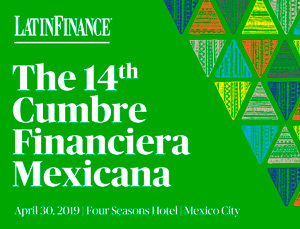 The U.S.-Mexico Chamber of Commerce is the leading binational business organization working to build and strengthen trade and investment relationships between the two countries. With strong local membership and international contacts, USMCOC chapters and offices help businesses bridge differences in legal, regulatory and economic systems, as well as language and culture. Each year, the organization bestows its Good Neighbor Awards, given in Washington, D.C., and Buen Vecino Awards to ministers, ambassadors, governors, members of Congress, former presidents, corporate CEOs, leaders of organizations and others who have made a noteworthy difference in U.S.-Mexico relations.